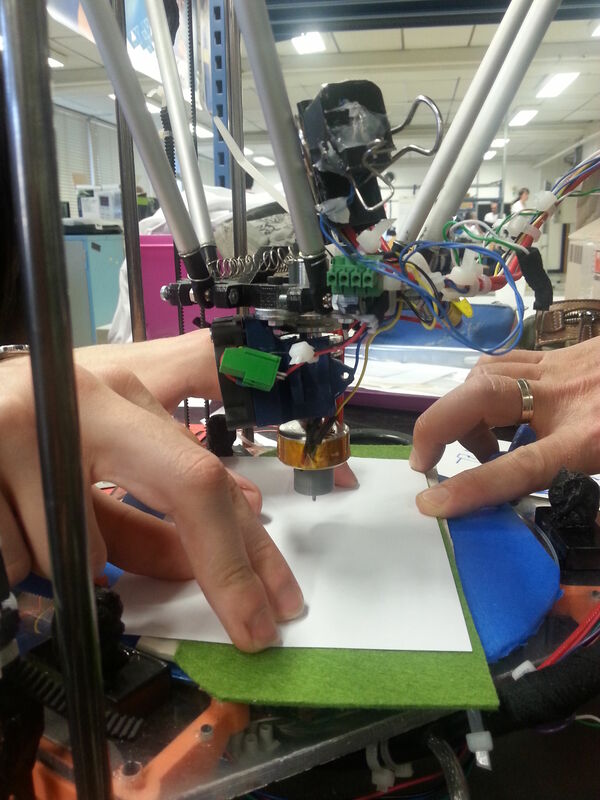 How to turn a 3D printer into a Braille embosser machine. You do need access to a 3d printer in order to use Braillerap project. Braillerap has only be tested on a Delata mini Rostck G2 and a cartesian Dagoma 3d printers. Every tests and improvements are welcome ! Github repository : https://github.com/arthursw/BrailleRap : MIT License. About context, state of the art, and braillerap workshop. Written by Flossmanuals in french. English version on github translated by Arthur Masson. 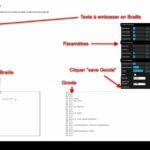 Braillerap great Gcode generator on Arthur Masson Github. You can use it directly online. 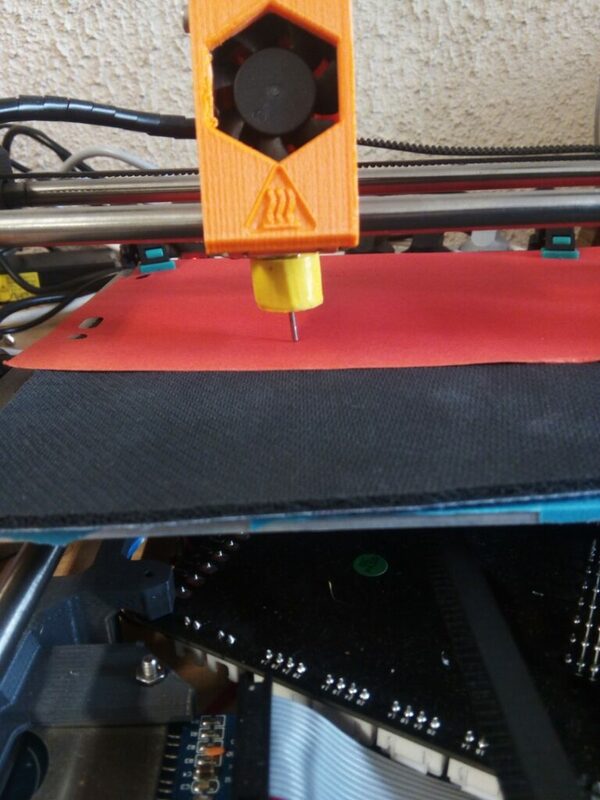 Can generate a 3D model that will became a plastic addon to 3d print and transform your 3d printer into a braille embosser. Openscad script you can open with openscad software in order to generate a part depending of your printer nozzle size. 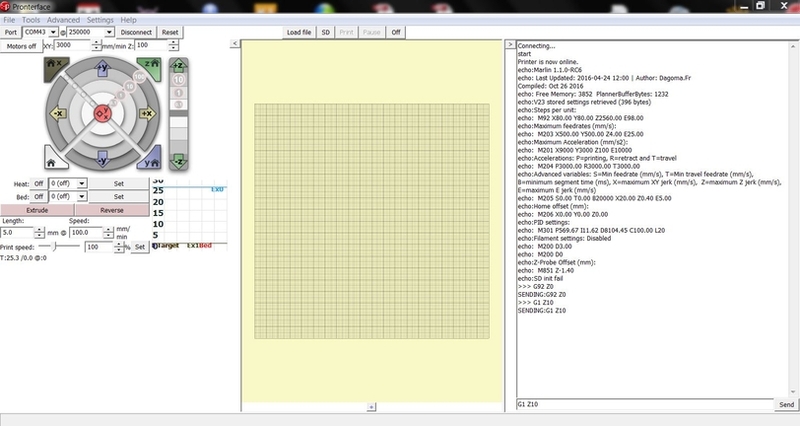 Free and open software able to stream Gcode and drive a 3D printer. Pronterface download for LINUX users. 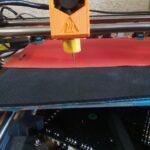 BrailleRap is a 3D printer hack to emboss Braille on paper or cardboard (even on plastic sheets of about 100 microns). You need a 3D printer capable of reading gcode (for example a reprap) in order to test of improve this prototype. 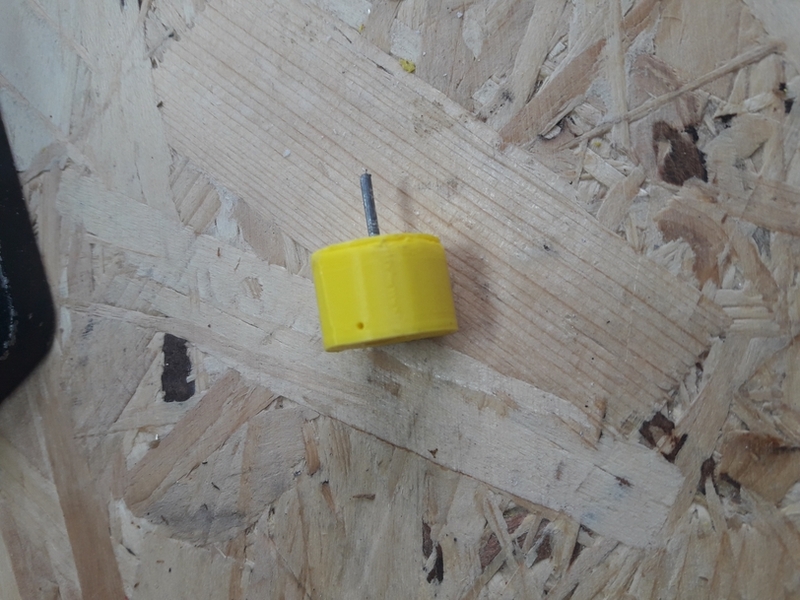 The concept is simple: we will first print a 3D nozzle for our printer to hold a customized nail. This object will convert our 3D printer to a Braille embosser. A dedicated webpage enables to compute the required gcode to move the head to emboss our text. Take measurements of your 3D printer head. Check the hexagonal plan dimensions of your 3D printer on the internet or measure it. Alternative method: take a flat wrench able to unskrew your nozzle. 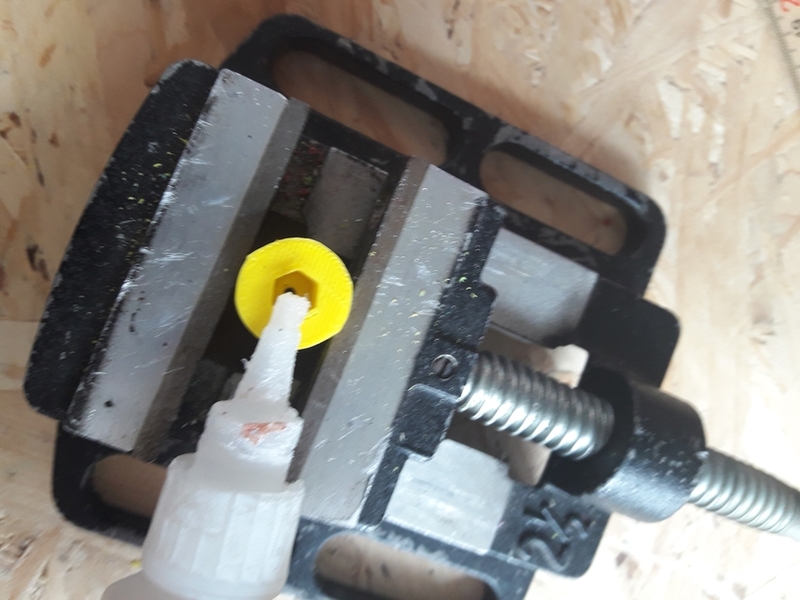 For our prototype, we had a 6mm nozzle. 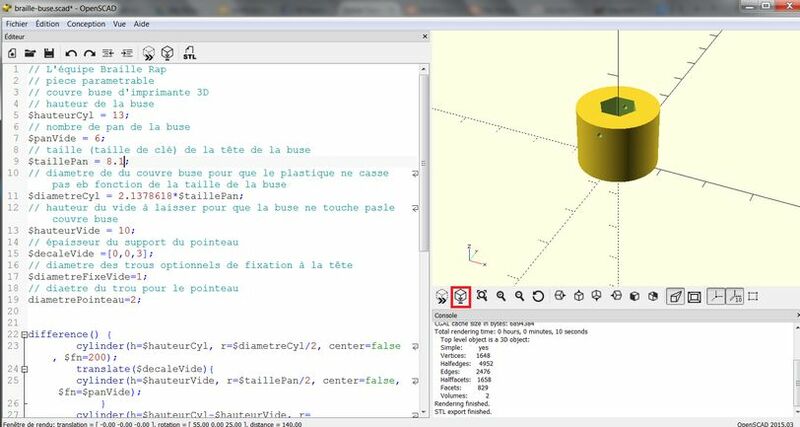 You will generate your 3D object (to hold the custom nail) yourself, with OpenSCAD. Open braillerap-buse.scad (created by Arezki Gastaud) with OpenSCAD. Parameters of the 3D object can be modified to fit your needs. Modify taille_pan to the size of your nozzle in mm, and add a small margin to be able to plug in. 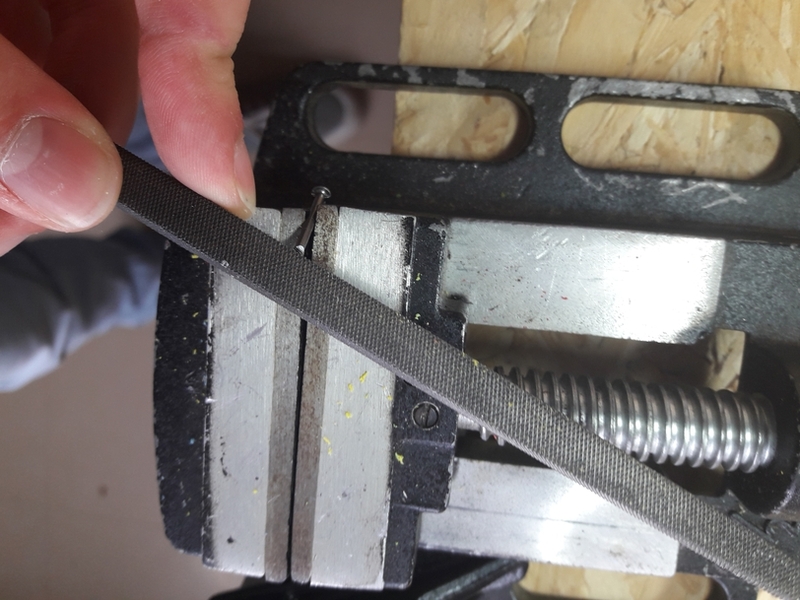 Our tests are successfull when adding 0.6 mm ; for example for a 6mm nozzle, set taille-pan to 6.6. Render and save your custom 3D object to a .stl file. Print it with a 40% filling. Now we will customize the nail. Take a nail (1mm diameter, 2cm long for example). 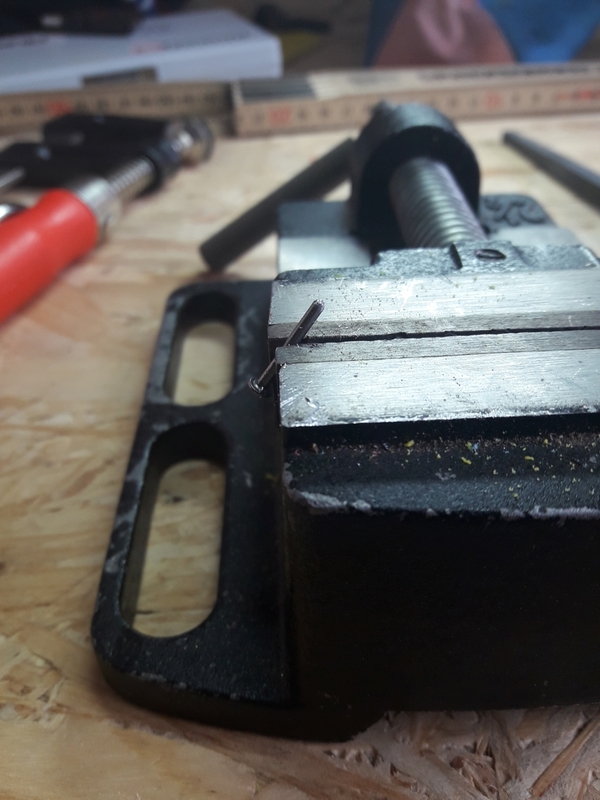 Cut the nail to reduce its length to 15mm. File it down to bow it. The goal is to emboss, not to run through it. The tip must be bowed. Heat the tip of the nail with a flame and fit it in the hole of the 3D object. 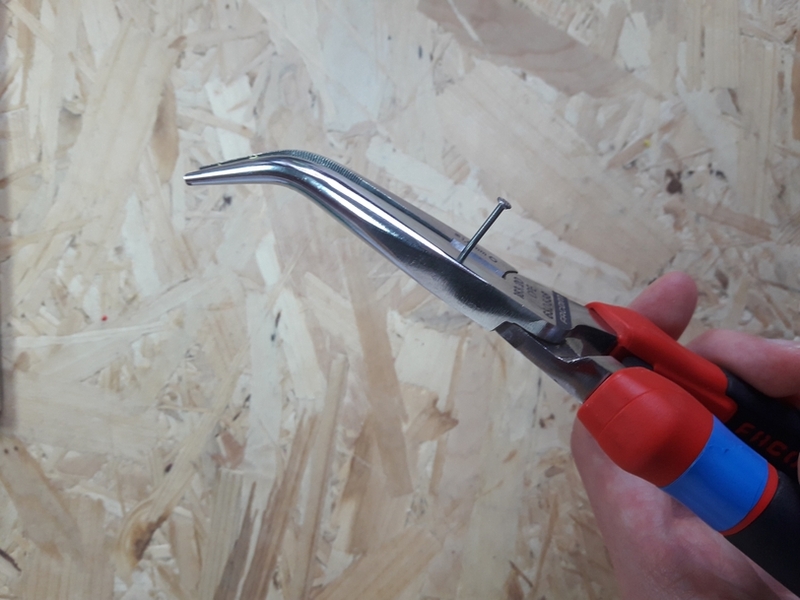 Extract the nail, glue it and put it back inside, wait for 30 sec, the punch is ready! Let your 3D printer cool down. BrailleRap works best at low temperature. Once your nozzle is cold, plug-in your custom punch. Your machine is ready! We will now generate the GCode from the text to emboss. 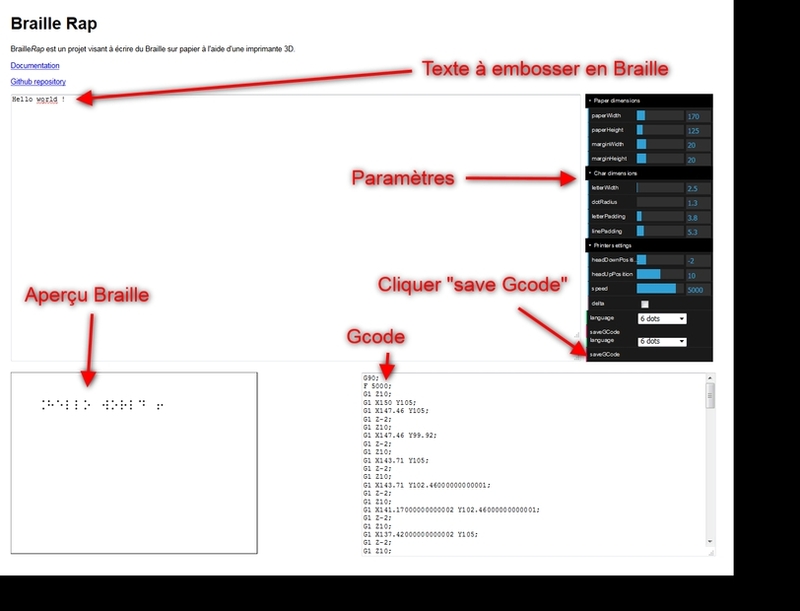 Go to the BrailleRap generator (developed by Arthur Masson and Yacine El Yacoubi). The source code is available under MIT licence. Enter the text you want to emboss in the first text area. The corresponding Braille and gcode is generated underneath. At the left, the user interface enables to modify settings and to download the computed G-Code (with the “download” button). The last button saveGCode of the user interface enables to download the computed G-Code. You can then import the generated file in the 3D printing software of your choice. The goal is to save this gcode on your computer to be able to launch it on the machine. headDownPosition must correspond to the height of the nozzle equiped with your custom head once it has embossed. The default value is 2 mm under the surface to emboss. headUpPosition must correspond to the maximum height of the tip above the surface to emboss, between each stroke. The default amplitude is 10 mm, our tests were also successfull with 5 mm. The delta checkbox must be checked only if you have a delta printer (like Rostock, Kossel 3d printers). Placing a felt sheet on top of a silicone rubber sheet lead to good results. Put your soft sheets on the (cold) printer board, and then the material (paper or cardboard) to emboss. Be careful that it does not disturb the machine moves in all directions. It is important to set the height of your machine at 0 (Z=0) with the nozzle touching the material to emboss. For this, we recommend using Pronterface, a free and open source software able to send G-Code to the 3D printer. You can then move up the printer head to 50cm with the command G1 Z50, put the soft sheets and material to emboss, install the custom tip on the head of your machine, and move it down until it gently touches the surface to emboss. Once in position, reset the z position to 0 by entering the command G92 Z0 in Pronterface. Nota : you can also directly define the offset in the online Gcode generator if you prefer. 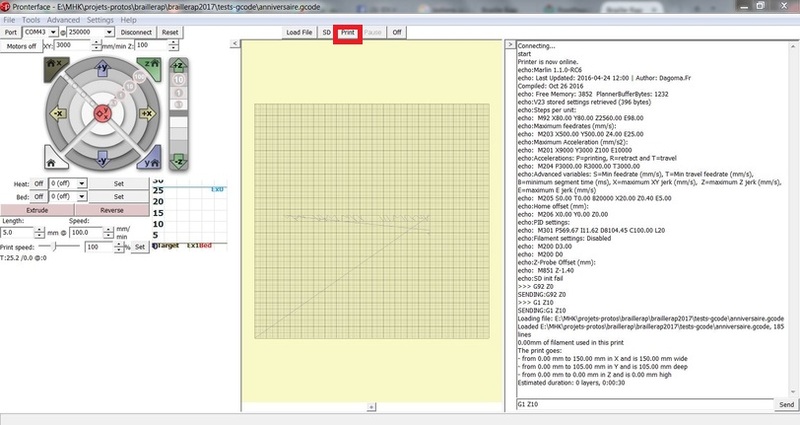 Upload and execute G-Code on the 3D printer with Pronterface. We recommand using a free open source software to send G-Code to 3D printers, or execute the G-Code from an SD card if your 3D printer is able to read SD cards. - Click “Print”: the printer embosses ! WARNING: this is a prototype. Any improvement and test are welcome!